Marija returned to the workforce in August 2012 after many years as a stay-at-home mother. She is the operations assistant at the Foundation for Vancouver Public Schools, a nonprofit organization that has created opportunities to cultivate and inspire student success since 1988. The foundation relies on donations to help ensure all students are prepared, confident and excited to learn. This goal is achieved through meeting basic needs to families in poverty, developing interactions with positive role models, and providing enrichment opportunities. Marija’s position involves management of mentoring programs, volunteers and donors. Patricia began her 15th year of teaching at Days Creek Charter School, where one of her assignments involves guiding seniors through the yearlong SAT, college admissions, financial aid, and scholarship process. She teaches secondary English and, occasionally, art at the middle school level. Patricia and her husband will celebrate their 44th wedding anniversary in December. Anna was hired as the principal of Pilot Rock High School, from where not only she graduated but also her parents, siblings and children. She became the first graduate to be an administrator in Pilot Rock School District. She had to resign from her city council post, but she believes being involved with city government was a learning experience. She was co-chairman of a reunion in her community celebrating 100+10 years (cen-ten-ial) of their city charter. Hundreds of people attended the two-day celebration. Joy began the Doctor of Leadership Program at Seattle University this summer. In July 2012, Jeri was promoted to director of the Dietetic Internship Program at Oregon Health and Science University after serving two years within the program as the placement coordinator as an instructor. She currently holds a faculty appointment in the Graduate Programs in Human Nutrition, where she enjoys teaching, mentoring students, building relationships with the program’s many constituents, and serving in an administrative role. Emily and her husband bought their first home in August. They did some remodeling before moving into their new home. Nils and his wife, Jen, had a daughter, Brynn Renée Thingvall, on April 26, 2012. Lisa will serve as the Chartered Financial Analyst (CFA) Society of Portland president for the 2013 fiscal year. Emerald was recently accepted into the Doctor of Education in Organization Leadership Program at City University of Seattle. This summer, Shauna and her husband, Dan, welcomed their first child, a healthy baby boy, into the world. Peter Alexander Altman was born June 26, 2012, in Pendleton, Ore. He was 8 pounds, 1 ounce, and 22 inches long. Jacob is entering his fifth year as sole proprietor of Powell Butte Veterinary Service, a mobile, mixed-animal veterinary practice in Central Oregon. He lives on a 40-acre ranch, raising registered black and red Angus cattle, as well as six other species of animals. Rebecca recently opened her own law practice, The Law Office of Rebecca Russell, in the Salem-Keizer area. She practices immigration law, primarily family-based petitions, and citizenship applications. Jeremy graduated from Emergency Medicine Residency and is board certified in emergency medicine. He recently took a position at Concord Hospital in Concord, N.H.
Thomaida travelled to Ulaanbaatar, Mongolia in June 2012 with a team from the Orthodox Christian Mission Center at the invitation of the first and only Orthodox Christian parish in the country. Highlights included staying in a yurt, sharing Mongolian traditional foods, and using Russian language skills to communicate with the locals. Steven married Gwynne Engelking on Aug. 4, 2012, at the New Leaf Greenhouse in Forest Grove, Ore. In a unique and homegrown style that matches the core values of the couple, they grew all of the flowers for the event at the greenhouse, grew all of the vegetables for the reception dinner on-site, and caught all of the salmon for the dinner. They also brewed the beer and served prime rib from Oregon Country Beef, a co-op where Steven’s family sells cattle raised at the family ranch. They live in Portland, Ore. Steven works as an engineer at a medium-sized, private company. Timisha graduated from Portland State University with a Master’s of Social Work. She has begun the application process to be a licensed clinical social worker, and is currently a licensed clinical social work associate. She hopes to one day work with middle- or high-school students and have some experience in a hospital setting. Last year, Timisha expanded her volunteer experience internationally by participating on a mission trip to Mexico, where she helped expand a church and ran a five-day Vacation Bible School for almost 80 kids daily. Kevin has been promoted twice within the last six months and is now the lead content designer for Zynga’s Pioneer Trail at Zynga, Inc., the world’s leading provider of social game services. Kevin and his wife also celebrated their first wedding anniversary in June. Josh has worked for Abercrombie and Fitch for the last seven-and-half years since graduating from San Diego State University. He spent three years abroad in the United Kingdom before being promoted to regional manager of the Southwest United States. 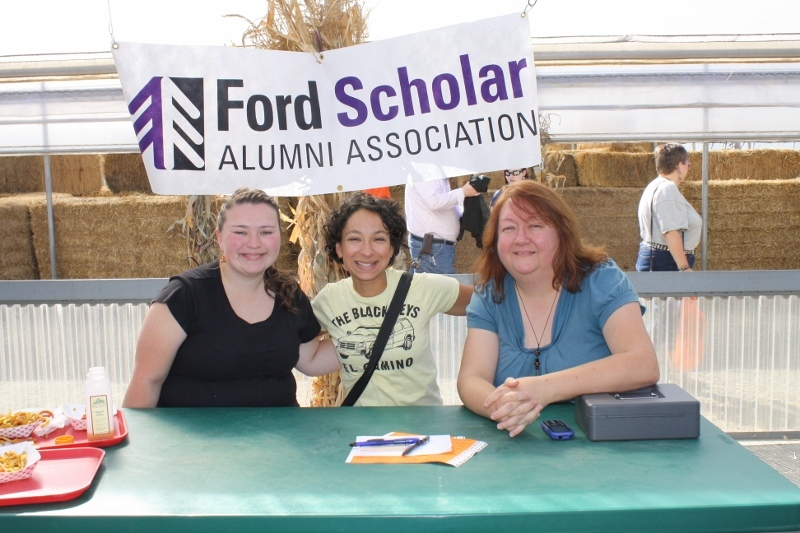 DJ married Class of 2004 Ford Sons and Daughters Scholarship recipient Megan Goddard in August 2011. Their son was born on Sept. 23, 2012. They live in Eugene, where he works for an engineering consulting firm and Megan works in commercial credit and lending. Sara recently moved to Keizer, Ore., and works with Polk County on their crisis team. She works in the rural area of Dallas, assisting individuals, hospital staff, jail staff and law enforcement in addressing crisis situations. She hopes to continue to facilitate groups as well. Annamarie worked as an admission counselor and a resident director at Southeastern University in Lakeland, Fla., after graduating from George Fox University. Later, she transplanted to Winston-Salem, N.C., to complete a Master of Arts in counseling from Wake Forest University. She works full time as a community counselor, providing community-based therapy and case management for chronically mentally ill individuals. She recently became a licensed professional counselor and works as an adjunct instructor for the Wake Forest Counseling Program. She and her husband, Terry, expect their first child in February. They have a puppy that will be a therapy dog. This fall, Patrick started a Ph.D. program in Natural Resources Management at Stockholm University, in Stockholm, Sweden. His research will focus on the relationship between rainfall, land-use change, and rain-fed agriculture. Zachary and his wife had their first child, a girl, Ezrah Nayara, on June 11, 2012. In February Zachary traveled to Honduras with the charity he founded, Project Sole, and gave away 2,000 pairs of shoes in different orphanages outside of the capital city Tegucigalpa. Vicki and her husband, Chad, just had their first children – twin boys! They were born July 25, 2012. Ethan John Ash was 3 pounds, 15 ounces and 17 inches long and Coen Rudy Ash was 4 pounds, 12 ounces and 18 ¼ inches long. Brittany married Jason Daugherty in Winston, Ore., on June 20, 2012. Jennifer married Ruben Gomes in July 2011, and they welcomed their first child, Scarlett, in January 2012. Erin and her husband, Richard, a Ford ReStart Scholar from the Class of 2009, welcomed their second son, Anz Tayden Kitumba, on July 6, 2012. In 2012, Heather received a promotion at the park and recreation district where she works and now supervises the school-age programs, including a before- and after-school program and all school-age summer camps. Heather and her husband expect their first child, a boy, in December. Julie continues to work as a labor, delivery, recovery, post-partum nurse at a small rural hospital. She recently became a nationally certified lactation consultant, which enables her to further assist her maternity patients, as well as her small community of families. Now that her youngest child has started school, Julie plans to begin her education toward becoming a certified nurse midwife. She recently became certified in bio/chemo IV therapy, allowing her to be diverse in what she can offer her small facility. Leana was accepted to the Master of Arts English program at Portland State University and will continue her educational and career journey this fall. August kicked off an exciting new school year as Rebecca began teaching for her second year at Butteville Elementary School in Edgewood, Calif. She shares the job with another third-grade teacher, which allows her to stay at home with her daughter, Laney, a few days a week. Laney turned one on Aug. 6. Jeremy recently finished his master’s degree in communication, culture and technology at Georgetown University in Washington, D.C. This fall, he started Ph.D. work in learning sciences at the University of Illinois at Chicago where he researches digital literacy and learning technologies for better higher-education classrooms and student success. Katie’s second son, Kase Ward, was born on her and her husband’s seventh wedding anniversary, June 24, 2012. She accepted an instructor position at Rogue Community College, where she teaches biology and anatomy and physiology. Timothy is enrolled in a full-time Master of Arts in Teaching program at Concordia University in Portland. He teaches in a second grade classroom at Westside Elementary in Hood River. He will then spend six weeks in a fourth grade classroom before graduating in December. He will be endorsed to teach kindergarten through eighth grade in a contained classroom. On Aug. 4, 2012, Emily and Eli Conlee were married in Redmond, Ore. They met at the 2006 Ford Scholars Conference before they began their freshman year at Corban University. They spent the next four years matching their class schedules and becoming each other’s personal editor. As graduation brought new adventures, they continued their friendship from East to West Coast. Now after six years, the two long-time personal editors have become husband and wife. They live in Bend, Ore., working and enjoying the Cascades Mountains. Heather married Nick Wolter on July 21, 2012. Thao Trang studied abroad in Denmark last year, meeting people from all over the world and experiencing life in a different culture. She learned many languages, and her cooking skills have never been so excellent! She earned credit for electrical engineering and computer science in intense academic courses. This summer, she went to Kiev, the capitol of Ukraine, so she could learn Russian. She again met people from all over the world and was able to see the eastern side of Europe. Her dreams in electrical engineering and becoming an interpreter are within reach. Lily began working for the American Cancer Society as an administrative assistant in the spring and in August was promoted to a community relationship manager. This job is her first step in pursuing her dream of working with non-profit organizations while also using her Bachelor of Science in public health. Lily recently completed the Hood to Coast, “The Mother of All Relays,” spanning 199 miles from Mt. Hood to Seaside, Ore. Lily and Andrew Westlund are engaged and are planning a September 2013 wedding.